Welcome to the latest Mayor’s Musings! I had another busy week as I attended 9 engagements which varied from the spectacular Rowan Park School Musical to the Southport Charity Committee Coffee Morning. It was an honour to be invited to all engagements which I again want to take the opportunity thank for the invitations and hospitality. Myself and the Mayoress were both looking forward to another delightful School Musical at Rowan Park School having attended last year’s wonderful show. We were met with great pleasure by Cathy Harley who then introduced us to where we would be situated for when the show begun. Once the show had finished, we were given the opportunity to congratulate and applaud the students as well as the staff for making the night such a huge success and also congratulate them for their hard work and commitment. Myself and the Mayoress were also given the opportunity to have some refreshments after the show before we left. Both of us would like to take this opportunity to thank the whole of the Rowan Park School for inviting us, in fact we enjoyed ourselves that much, I have been invited to their leavers Assembly on July 17! The Dementia Friends Training Session was an engagement which myself and the Mayoral officer took pride in being a part of due to Dementia being such a huge part of the community. The event was organised by Athena Healthcare and it really was an interesting course that taught me a great deal about how people with this condition see things. It is always a pleasure to welcome new people into the UK citizenship – in particular to our wonderful borough. 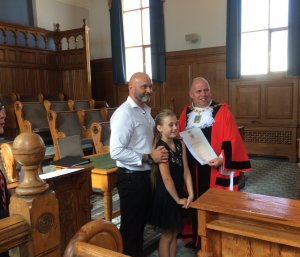 The latest Citizenship Ceremony welcomed 8 new people into Sefton. It was a delight to be at such an event which thrives on hard work and dedication from the people of the community. The Charity Committee Coffee Mornings are always a fantastic opportunity to get to know the community more and find out a little bit more of an insight of which charities are most community driven as well as finding out why and how specific charities started. It was with great pleasure and honour to be invited to welcome a new Reverend to the community in Reverend David Andrew Stott. I believe that he will take great pride in his job and complete his job with great pleasure. Grange Primary School has been a huge part of its community for the best of 50 years this year and I and the Mayoress were delighted to be invited to the celebration of the 50th anniversary of this great communal building. Grange Primary school isn’t just a place where children go to school and people go to work, it’s also a place in which the community comes together to help of families and charities in need by holding coffee mornings as well as many more charitable events. The Mayoress and I took great pride in accepting our invitation to join St Joseph’s Garden party as well as even being judges for their special event of the teddy bears parade! This event is another fantastic example of the community pulling together in order to help out others. 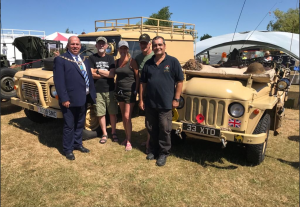 The Crosby Lions Carnival provides an opportunity for the community to gather together to raise much needed funds as well as providing a great day out for the Crosby families. Crosby and District Lions Club is a member of Lions Clubs International which is the largest service organisation in the world with nearly 1.5 million members ano over 200 hundred countries including China.